New Cebu Pacific promo tickets up for booking to select domestic and international destinations! Check the Cebu Pacific sale tickets which you can buy or book from today until January 11, 2018 for Philippine local routes and until January 14 for international travel. Domestic promo fares from this sale start at P899 while foreign trips cost as low as P2,099 per way. 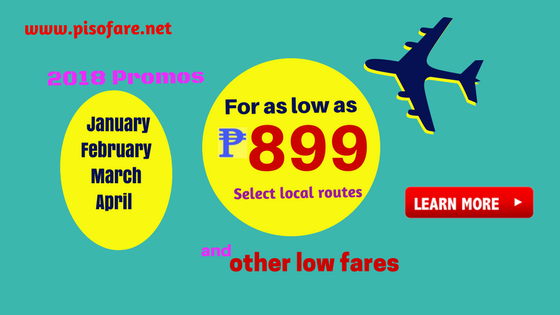 Visit Boracay via Kalibo for only P899 from Cebu or Kalibo. The flight for Manila or Clark to Boracay (via Caticlan) is as low as P1,799. Visit Hong Kong or Macau for only P2,099 or P2,599 All in fare. Low fares to other foreign destinations also available. Quoted Cebu Pacific promo tickets are good for one- way travel. Inclusions: free 7 kilos hand carry baggage, base fare, Web Admin Fee, taxes and fees. Airport fees for domestic flights and international airport fee for flights from Manila are included in the promo fare. Book and avail the Cebu Pacific low fares by a) booking online at www.cebupacificair.com, b) buying the tickets at Cebu Pacific ticketing offices, accredited travel agents or booking offices or, c) calling Cebu Pacific hotline at phone #: (02) 702 0888 (Manila) or (032) 230 8888 (Cebu) to reserve the low fares. For your convenience in buying the Cebu Pacific tickets, here are the List of Cebu Pacific Ticketing Offices in Metro Manila, Luzon, Visayas and Mindanao. Want to avail the Cebu Pacific promo fares? Book or buy tickets fast to get the lowest fare! Cebu Pacific promo fares are limited and are not available on all flights! For more Cebu Pacific, Air Asia, PAL and other airlines promo fares and seat sale 2018, PISO FARE promos, travel tips and updates, do not forget to LIKE and FOLLOW our Facebook: PISO FARE TICKETS!! !